Snow squall or not, I just had to get outside. Not enough snow for a cross-country ski, but, after too much time indoors, I had to do something outside. I was driven to break a fundamental rule of the garden. 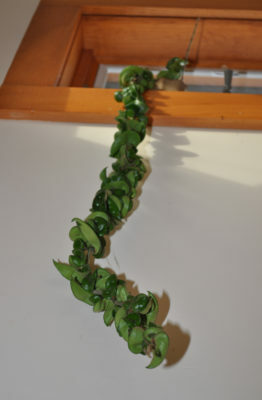 I pruned, and that’s a no-no. 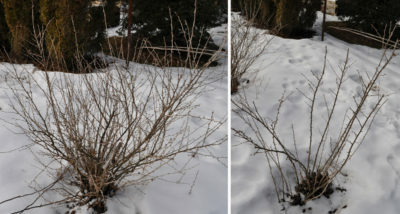 Pruning is best delayed until at least after the coldest part of winter is over, ideally closer to the time when warmth and sun are stirring buds to swell in preparation for their final burst. I did rationalize that any pruning now would leave me that much less to do amidst the hubbub of spring gardening activities. 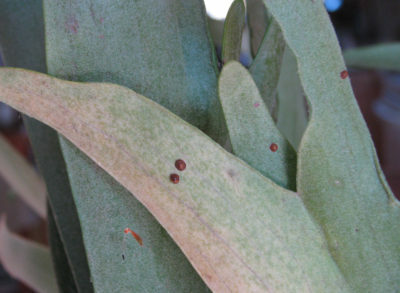 As if to ring in the new year, scale insects are starting to make their presence known. These insects crawl around as babies, find nourishing spots on leaves or stems, insert their feeding tubes, and then spend their days sucking plant juice. 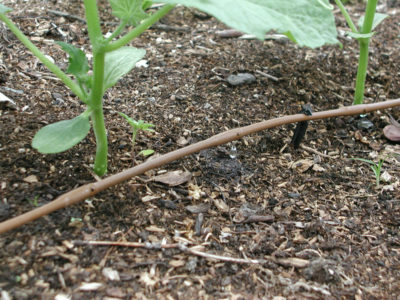 Carbohydrates and sugars are what result when sunlight and chlorophyll get together, so longer days may already be making plant sap sweeter and more plentiful, much to the liking of these suckers. 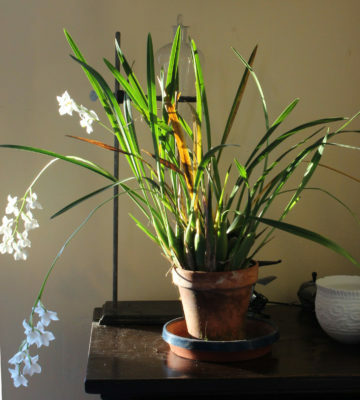 My sidestepping took a turn into orchid-land 25 years ago when a local orchid enthusiast gave me a plant of Odontoglossum pulchellum, which I today learned has also been called lily-of-the-valley orchid. But more importantly today, the plant is in bloom. Blossoms from this plant are no rare occurrence; it’s bloomed every year for about the past 20 years, some years around now and other years waiting until February to unfold. 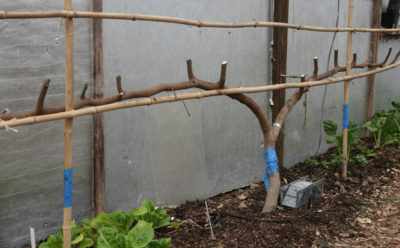 Learn about a way of watering that increases productivity, saves water, lessens diseases, and is easily automated. I’ll be holding a DRIP IRRIGATION WORKSHOP in Philadelphia on January 19, 2017 @ 6pm at PHS Town Hall, 100 North 20th Street (20th and Arch streets), first floor. The workshop is free.